-Welded and braced all steel frames. -14 gauge tubular steel handles with braces. -Hand controlled belt tightener clutch and forged, self-sharpening, non-winding slasher tines with welded blades. 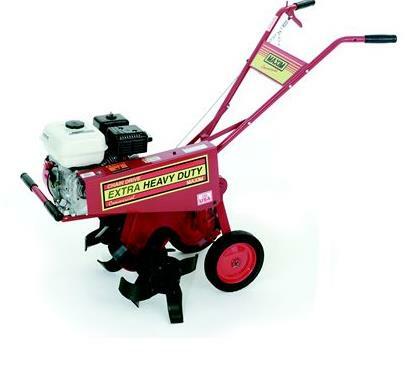 -Tines deliver standard 14" to 26" tilling width and 12" depth. -10 x 1.75 steel wheels are adjustable or removable for tilling. * Please call us for any questions on our tiller front tine 5 hp 26 inch width rentals in Mount Pleasant MI, Alma MI, and Saginaw MI.